I bet you would be great to interview. "So Flatfingers, tell us about the game"
"Well, it has much wowness, a sprig of awesomesauce, and an ehh of creativity. Also a sporkful of flexibility with the fleshing out of the sporadim." "Wowness indeed! We will be right back after a message from our sponsors while I try to decipher that." Heh. Me, you don't need. Charley_Deallus wrote: I bet you would be great to interview. That TOTALLY sounds like him, right Flat? IronDuke wrote: BUT WE CAN DEBATE!!! And you know we LOVE to debate! No, we don't. Not all of us. I didn0t mean YOU. I meant Duke and me. Pffshh. You're not always the person I'm referring to. Is that really how you see me...? I'm an unhappy puppy avoiding people because lonely? W00t! The Pre-Alpha Build drops on Thursday, August 10, at 1 PM Eastern time! Those who backed this game at the appropriate level will finally get to see the new art direction and core active gameplay systems in all their glory. Importantly, this includes the latest iteration of the Improvisation Engine. This is the fancy name for the game code that lets players discover their own ways of solving gameplay challenges -- including ways that the developers themselves may not have imagined. I'm not going to get to fiddle with this until very late tomorrow night at the earliest, but excited? Yeah. I wont speak about any sort of "spoiler" stuff until a few other fellow backers have had the chance to experience it. It's nothing ground breaking or story related per-se but it's neat experiencing it blind. 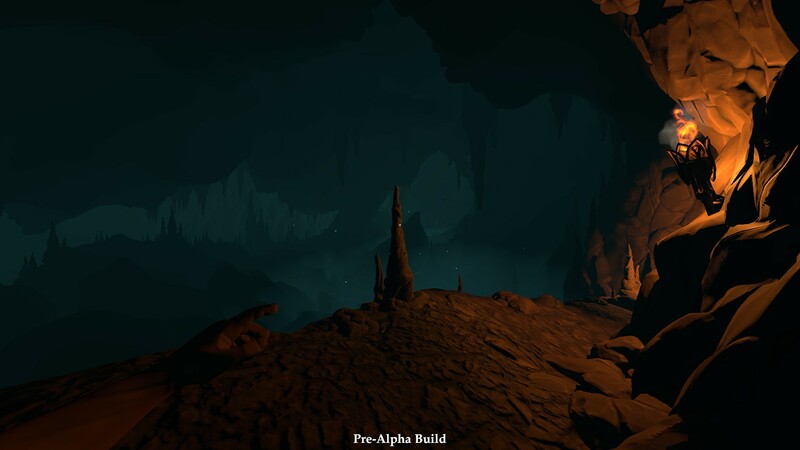 A cave, or rather a lower world. What I experienced was a great deal of fun, as expected there are a few bugs and things are a bit wonky/awkward. However all the things that were awkward in the prototype are much less awkward in this, I can tell that work is being done not only on the art but also in the mechanics. Stealth is much better than it was before, sword combat isn't great but not the nightmare it previously was (it's like night and day when compared to the prototype), and we have archery combat too which for me so far seems to be the most optimized experience (please note, this is after my first playthrough this opinion is likely to change the more I play). 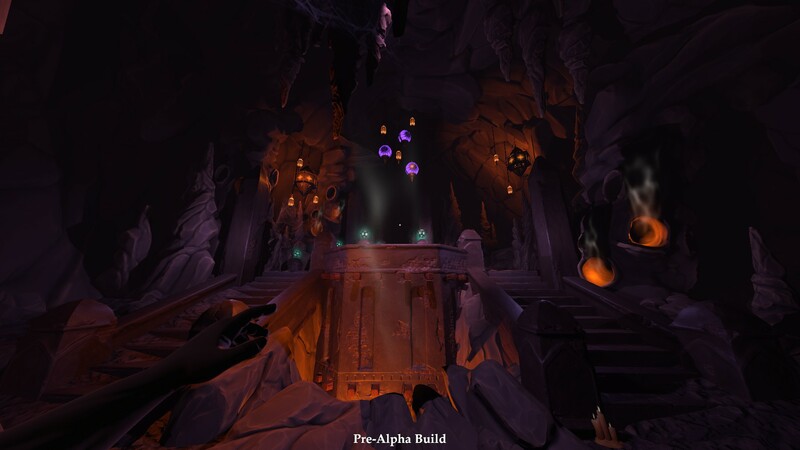 So what is the pre-alpha build? What does it offer? It's presented as a sandbox experience of course, one singular goal, multiple ways to achieve it, and the tools you might need are provided. My first play through took me much less time than I had anticipated, however I didn't go into it with the mindset that I would play with all of the available options. I decided to achieve the goal presented to me as quickly as possible to see if maybe there was more to do beyond it. (There isn't, not a big deal this is pre-alpha after all). Anyways, it took me about 5 minutes. Killed a few baddies, snuck around a bit, used a bit of magic to get beyond a certain trap, followed a path I believed would lead me to the goal and I was done! No need to stray off or do anything. This is something of a worry for me but not worth really judging the game on as this is just a demo to experiment with mechanics over being presented with any sort of challenge or story. Biggest issue? Framerate, I don't have a super beefy computer (although according to the IRC guys I'm well ahead of most of the regulars) and I was dropping down to 15 fps in some areas, and a solid 60 in the rest. Again it's pre-alpha and I went in expecting this but it is something of note for anyone who might be excited to try it out. Right now It's hard to tell but I believe the awkwardness of sword combat is in relation to the framerate I was experiencing at the time and the darkness of the area I was in. It was quite awkward and it was rather hard to tell if I was having any affect on the baddy at all (until he fell to the ground that is). The art work, it's amazing! UA isn't meant to be a realistic looking game, it has it's own art style that I feel is even in this early stage is very well executed, I'm absolutely in love with it. The only complaint I have in that area is that it seems like a majority of the areas are very, very, dark. Which is to be expected, it's a world located in a massive cave system. Even in this specific situation the baddies around you would not expect to need light sources. However the art seems to suffer a bit from the darkness, my next play through I intend of pushing the brightness up just a bit in hopes that I can at least make out faint shapes in the dark. Anyways this is my ramble about it so far, I'm very happy with the progress made! Nice review, BMRX -- thanks! I may add a few words once I've had a chance to fiddle with it (Fiday, I hope).